The Vril Engine was developed on the back of the orgone stack project. 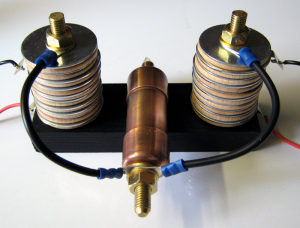 There are several areas, which need further experimentation, such as types of eloptic conductor, and orgone insulator. We believe, that in order to gain the best form of eloptic output from the Vril Engine an organic insulator should be used. On top of this we need to discover if the separation distance of the eloptic conductor, plays a major part in determining the Vril energy output. If as suspected, it is, then a closer spacing with minimal thickness insulation would yield stronger results. The Vril Engine uses the orgone stack technology, and regular orgone matrix tech. The orgone stack directs the eloptic energy towards the Vril Engine output device, which is then pulsed with a set square wave frequency of 7.83Hz. The solenoid is wound from the bottom of the Vril output module to the top. The frequency is then injected from the bottom of the winding, before returning at the top. This is done so that the h-field is driving the eloptic energy along its path towards the operator. The coil is not currently present in the photographs, but that is the next phase of construction. 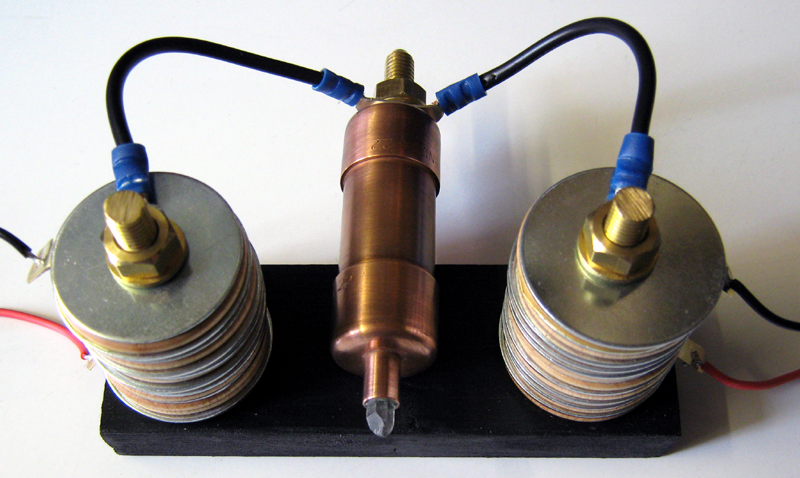 Two coupling electrodes are used within each orgone stack. 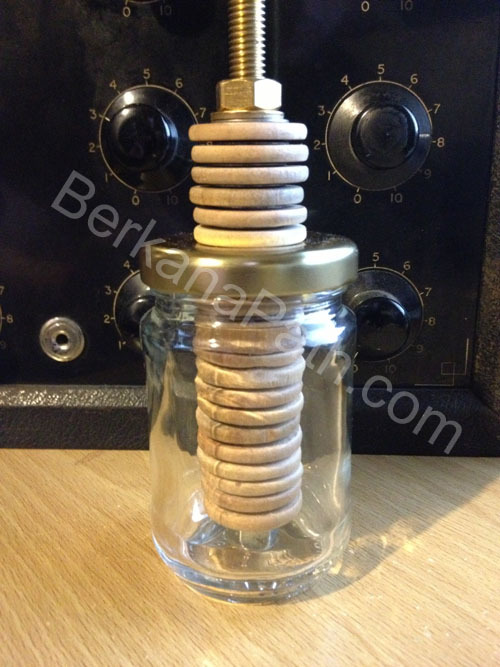 This is purely experimental and is based on a German patent (DE19915730) The applied electric field, enhances the E-field in the eloptic insulator, in the example of these orgone stacks, the insulator is comprised of solid birch wood, still utilising the organic principals of Reich. An eloptic conductor component is made up of Zinc coated steel. The steel allows for the magnetic h-field to create a more pronounced flux, in comparison to non ferrous materials. A high voltage input is preferable, but has not yet been tested. Even a small DC power supply will slightly alter the electron alignment in the orgone insulator material. Since there is no large scale current drain, the DC source can be supplied by batteries for a long period of time. The combination of the E-fields, and the h-fields at 90º to one and other create a G-field, See [Aspden No.3. (2005)] for the theory of electrostatic gravity. As an experimental process we are looking at the effects of light absorption in determining the best form of eloptic reflector to make up the conductor of the Vril Engine’s orgone stacks. It seems logical to make one side of the eloptic conductor, rough and absorbing, while the other side of the eloptic conductor should be polished and reflective. 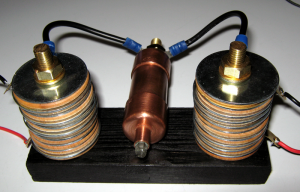 Overall, it may turn out that an entirely transparent orgone stack may prove to be the most conducive form of eloptic capacitor for the Vril Engine. The trick is finding an affordable, transparent, and conducting solid material. The Vril Engine is still very much a long running research project, but is due to be mounted into the core of a new psionic device. Over time, we may be successful in determining the most appropriate materials, and assembly for the orgone stacks, and possibly future versions of the Vril Engine. A great video guide by Sensei Dennis on how to build HHG’s also known as Holy Hand Grenades. These are powerful orgone accumulators and generators and can be used in a number of applications. I also highly recommend other videos by Sensei Dennis on YouTube.